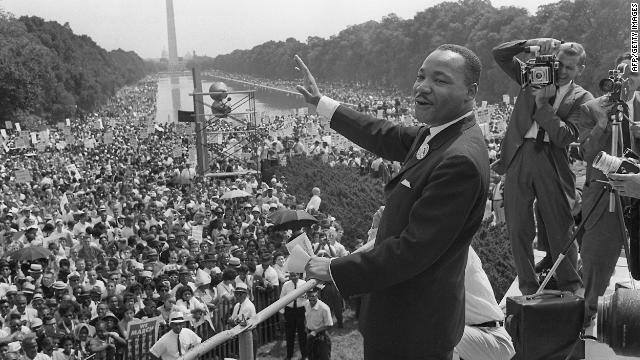 The civil rights leader Martin Luther KIng (C) waves to supporters on the Mall during the 'March on Washington'. (TIME) - So many scenes from the August 28, 1963 March on Washington are today so familiar — and the cadence of Martin Luther King Jr.’s “I Have a Dream” speech is so much a part of the national consciousness — it’s easy forget that for the hundreds of thousands of people who marched, the event was wholly, thrillingly new. There had been, of course, other civil rights protests, marches and demonstrations. But none had been so large (estimates range anywhere from 200,000 to 300,00 people) and none garnered so much attention before, during and, especially, after the event itself. The landmark 1957 Prayer Pilgrimage for Freedom, for example, which also took place in the nation’s capital, had shown everyone — segregationists and civil rights proponents, alike — that large, peaceable rallies in the heart of Washington were not only possible, but in fact were necessary if the movement was ever going to achieve its central, early goals of desegregation and voting rights reform. Yet many blacks in power have become just as discriminatory and racial as the people they struggled against during Dr. King's day. Their targets are mostly new immigrants who have done nothing to them, and they should know better; but goes to show you, there is no more all-encompassing bitterness and long memory than that of the old powerless, nor greater self-centered smugness and amnesia than that of the new powerful. I seriously doubt that most people under 60yo are familiar with this march or the many other sacrifices that were made in the name of civil rights. I wonder what will make it onto the Democratic National Convention playlist may the past and the present join with a song But Beautiflul Tony Humphries THP Remix. on the album Billie Holiday remixed and remasterd by Sony Records.